"Where Have All the Pop Stars Gone? 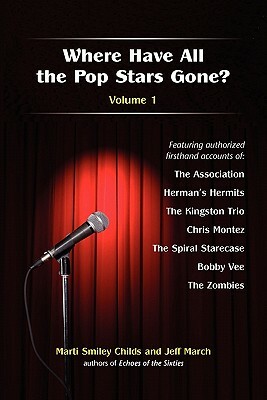 -- Volume 1" chronicles the lives of musical soloists and band members whose songs hit the top of the music charts in the late 1950s and in the '60s. Through conversations with them, as well as producers, managers and family members, we share fascinating behind-the-scenes glimpses into the lives of these creative, talented people. "Where Have All the Pop Stars Gone? -- Volume 1" includes authorized biographical chapters on seven musical groups and solo performers: THE ASSOCIATION (whose songs include three gold records -- "Cherish," "Windy" and "Never My Love"); HERMAN'S HERMITS (whose extensive string of hits includes three gold records -- "Mrs. Brown, You've Got a Lovely Daughter," "I'm Henry VIII, I Am" and "There's a Kind of Hush"); THE KINGSTON TRIO (whose enormous popularity reflected in seven gold albums triggered the folk music craze of the early '60s, and whose hits included million-selling "Tom Dooley," along with "Where Have All the Flowers Gone" and "Greenback Dollar"); CHRIS MONTEZ (whose hit tunes included "Let's Dance," "Call Me" and "The More I See You"); THE SPIRAL STARECASE (who recorded "She's Ready," "No One For Me To Turn To" and the smash hit "More Today Than Yesterday"); BOBBY VEE (whose 30 hit records included "Take Good Care of My Baby," "The Night Has a Thousand Eyes" and the million-selling "Come Back When You Grow Up"); and THE ZOMBIES (whose hits included "She's Not There," "Tell Her No" and the gold record "Time of the Season").